This article is about the town in England. For other uses, see Dudley (disambiguation). Mentioned in the Domesday Book as Dudelei, in the hundred of Clent in Worcestershire, the town was listed as being a medium-sized manor in the possession of Earl Edwin of Mercia prior to the Norman Conquest, with William Fitz-Ansculf as Lord of the Manor in 1086. Dudley Castle, constructed in 1070 by William's father Ansculf de Picquigny after his acquisition of the town, served as the seat of the extensive Barony of Dudley, which possessed estates in eleven different counties across England. Of historical significance, the town was attacked by King Stephen in 1138, after a failed siege of the castle following the Baron's decision to support Empress Matilda's claim to the throne during The Anarchy. The castle provided the centre from which the town and borough grew, with early coal and iron workings helping establish Dudley as a major market town during the Middle Ages, selling not only agricultural produce, but also iron goods at a national level. Working iron and mining for coal was in practice as early as the 13th century. The first mention of Dudley's status as a borough dates from the mid-13th century, when Roger de Somery, then Baron of Dudley, approved of the establishment of a market in nearby Wolverhampton. An inquisition after his death further established the value and importance of the borough, with mentions to the town's growing coal industry. 1814 map showing Dudley as an exclave of Worcestershire. By the early 16th century the Dudley estate, now held by the Sutton family, had become severely in debt and was first mortgaged to distant relative John Dudley, Duke of Northumberland, before being sold outright in 1535. Following Dudley's death, the estate returned to the Sutton family, during which time the town was visited by Queen Elizabeth during a tour of England. In 1605, conspirators of the Gunpowder Plot fled to Holbeche House in nearby Wall Heath, where they were defeated and captured by the forces of the Sheriff of Worcestershire. During the English Civil War Dudley served as a Royalist stronghold, with the castle besieged twice by the Parliamentarians and later partly demolished on the orders of the Government after the Royalist surrender. It is also from around this time that the oldest excavated condoms, found in the remains of Dudley Castle, were believed to have originated. Dudley had become an incredibly impoverished place during the 16th and 17th centuries, but the advent of the Industrial Revolution began to reverse this trend. In the early 17th century, Dud Dudley, an illegitimate son of Edward Sutton, 5th Baron Dudley and Elizabeth Tomlinson, devised a method of smelting Iron ore using coke at his father's works in Cradley and Pensnett Chase, though his trade was unsuccessful due to circumstances of the time. Abraham Darby was descended from Dud Dudley's sister, Jane, and was the first person to produce iron commercially using coke instead of charcoal at his works in Coalbrookdale, Shropshire in 1709. Abraham Darby was born near Wrens Nest Hill near the town of Dudley and it is claimed that he may have known about Dud Dudley's earlier work. Dud Dudley's discovery, together with improvements to the local road network and the construction of the Dudley Canal, made Dudley into an important industrial and commercial centre. The first Newcomen steam engine, used to pump water from the mines of the Lord Dudley's estates, was installed at the Conygree coal works a mile east of Dudley Castle in 1712, though this is challenged by Wolverhampton, which also claims to have been the location of the first working Newcomen engine. Dudley's population grew dramatically during the 18th and 19th centuries because of the increase in industry, with the main industries including coal and limestone mining. Other industries included iron, steel, engineering, metallurgy, glass cutting, textiles and leatherworking. During this time living conditions remained incredibly poor, with Dudley being named 'the most unhealthy place in the country', which led to the installation of clean water supplies and sewage systems, and later the extensive development of council housing during the early 20th century to relocate the occupants of local slum housing. Following the Reform Act of 1832, Dudley returned one Member of Parliament, a privilege first enacted in the Parliament of 1295. The town was re-incorporated as a Municipal Borough in 1865, later becoming a County Borough in 1889. Dudley was developed substantially in the early 20th century, with the construction of many entertainment venues including a theatre and cinemas, with two indoor shopping centres being added later in the century. Dudley Castle, which had fallen into ruin following a fire in 1750, was converted into a zoo in 1937 by the Earl of Dudley, with buildings designed by architect Berthold Lubetkin. A reported 250,000 people attempted to visit the site upon the first day of opening. In World War II, Dudley was bombed on several occasions. On 19 November 1940 a Luftwaffe bomb demolished a public house in the town centre and damaged several nearby buildings including St Thomas's Church and the new Co-Operative department store, but there were no fatalities. However, on the same night a landmine was dropped in the Oakham area of the town and demolished a section of council houses in City Road, resulting in the deaths of 10 people and injuring many others. On 12 August 1941, four people were killed when another landmine was dropped in nearby Birch Crescent. These were the only fatal air raids on Dudley. Following local government reforms in 1966, Dudley was expanded to include the majority of the former urban districts of Brierley Hill and Sedgley, along with parts of Coseley, Amblecote and Rowley Regis; an area in the eastern section of the town was also transferred into the new borough of Warley. Most of this land had been held by the Lords of Dudley, and contained within the Dudley registration district and parliamentary borough. In 1974, further reorganization led to the creation of the present-day metropolitan borough, which included the nearby towns of Stourbridge and Halesowen. Dudley was struck by an F1/T2 tornado on 23 November 1981, as part of the record-breaking nationwide tornado outbreak on that day. The tornado touched down in Woodsetton, subsequently passing through Dudley town centre, causing moderate damage, before dissipating. The declining industry in Dudley has given rise to high unemployment, resulting in the closure of many businesses in the town. The development of the Merry Hill Shopping Centre between 1985 and 1990 also saw the loss of most of the town centre's leading name stores, which relocated to take advantage of the tax incentives offered by Merry Hill's status as an Enterprise Zone. The financial crisis and recession resulted in even more of the retail units in the town centre becoming vacant, with the Woolworths store on Market Place closing in December 2008 when the company went bankrupt, and Beatties closing its store – the last department store in the town – in January 2010, after more than 40 years due to falling trade. Dudley is the administrative centre of the Dudley Metropolitan Borough, and is governed by the Dudley Metropolitan Borough Council. The metropolitan borough, which also includes the towns of Stourbridge, Halesowen and Brierley Hill has a population of 312,925. For many years the town (but not the castle, which was outside the boundary in Staffordshire) formed part of an exclave of the county of Worcestershire. Despite the more recent changes in county boundaries, the town and borough still remain part of the Anglican Diocese of Worcester. The town had been a manorial borough from the end of the 13th century, and from at least the 16th century until the passing of the Dudley Town Act of 1791, was governed by the Court Leet of the Lords of Dudley. From 1791, the Town Commissioners were the main local authority although the Court Leet continued to meet until 1866. In 1836 the Dudley Poor Law Union was formed, consisting of Dudley itself, and the parishes of Sedgley, Tipton, and Rowley Regis. In 1853 the Town Commissioners were superseded by the Board of Health, before the town was eventually incorporated into a municipal borough in 1865. It became a county borough in 1888 under the Local Government Act. Dudley's Council House in Priory Road was opened in 1935 by King George V, and was financed by the then Earl of Dudley, William Humble Eric Ward, to replace the original building from 1870. The present Town Hall opened on St James's Road in 1928; it stands next to council offices which were converted from the old Police Station in 1939, after the construction of a new building on nearby New Street. In 2012 the Dudley Metropolitan Borough made an unsuccessful bid to receive city status, losing out to Chelmsford, Perth, and St. Asaph. Dudley presently has two parliamentary constituencies, Dudley North and Dudley South, which cover the town and its surrounding area. The current MPs elected from these seats to the House of Commons are Labour's Ian Austin, and the Conservative Mike Wood, respectively. In October 2017, revised government proposals to constituency boundaries were revealed, which would reduce Dudley to just one constituency. The town itself would be divided between multiple constituencies, including ones predominantly based in neighbouring council areas such as Wolverhampton and Sandwell. The 13th century ruins of Dudley Castle overlook the town, and is a Grade I listed structure. Dudley Zoo is built into the castle grounds, and houses a large collection of endangered species, and also the largest collection of Tecton buildings in the world. Under proposals by Dudley Zoo, in partnership with Dudley Council, St. Modwen, and Advantage West Midlands, the zoo is to be regenerated, which will see a former freightliner site redeveloped with a tropical dome, Asiatic forest, two aquatic facilities and walkthrough aviaries. It is expected to cost £38.7 million. There are many canals in and around Dudley, the main one being the Dudley Canal – most of which passes beneath the town in the Dudley Tunnel and is accessible only by boat because there is no towpath. The open sections of canal are popular with walkers, cyclists, fishermen, and narrowboat users. Many of the canalside towpaths have been upgraded for cycling, and some sections are part of the National Cycle Network. St James's Church at Eve Hill had a church school from the mid-19th century, but this was closed during the 1970s and was used as a community centre for several years before being transferred to the Black Country Museum in 1989. The site of the school remained undeveloped until 2008, when work began on a new health centre. There are 11 scheduled ancient monuments in Dudley and the surrounding district, and 260 listed buildings, including 6 Grade I listed and 19 Grade II* listed buildings. Dudley is home to a multiplex Showcase Cinema and Tenpin bowling alley, located in the Castle Gate complex north-east of the town centre. The Town Hall also acts as an entertainment venue, hosting dances, theatrical performances, and concerts. The town was formerly home to a number of cinemas and theatres, including the Criterion, Gaumont, Odeon, and Plaza. The Dudley Hippodrome was one of the largest theatres in the West Midlands, built along with the adjacent Plaza Cinema just prior to the Second World War in 1938. The 1,600-seat Art Deco venue was constructed to replace the earlier Opera House, which had burned down in 1936. After its closure in 1964, the building was in use as a bingo hall until 2009, when it was purchased by Dudley Council with a view for demolition. After long public opposition the building was leased to campaigners in December 2016, with the intent to restore it to theatre use; however the lease was revoked by the council in February 2018, citing a lack of progress. The Plaza Cinema remained open until October 1990. The building was then taken over by Laser Quest, until its closure and demolition in 1997. As of January 2017 the site remains undeveloped. The Odeon Cinema was converted into a Kingdom Hall for Jehovah's Witnesses in 1976. A present-day Odeon currently exists at the Merry Hill Shopping Centre. Until 2011, the JB's nightclub was situated on Castle Hill, after relocating from an earlier site in the 1990s. Claimed to have been the longest-running live music venue in the UK, the club hosted early performances by acts such as U2, Dire Straits, and Judas Priest. It closed after going into administration and has since reopened as a banqueting centre. The museums in Dudley celebrate the geological and industrial heritage of the town and the surrounding Black Country region, and its role in the Industrial Revolution. The Black Country Living Museum is an open-air living museum, which consists of reconstructed buildings from the surrounding area forming a living replica of an industrial village, with demonstrators portraying life in the region from that time. The Dudley Museum and Art Gallery was formerly located in the town centre, having first opened in 1912, but was closed by Dudley Council in 2016 as part of cost-cutting measures, despite widespread public opposition. Some exhibits are planned to be moved to the Dudley Archives Centre in 2017. According to ONS, there are two railway stations in Dudley, both just over a mile from Dudley town centre, these are Dudley Port and Tipton. They are within the town of Dudley but outside the borough boundary as parts of Sandwell are considered within Dudley Town. The nearest station to the town within the Dudley borough is Coseley. All of these stations are on the same line, served by local services operated by West Midlands Trains. The nearest regular intercity services run from the Sandwell and Dudley railway station in Oldbury, which was rebuilt in 1984 to serve the two boroughs. The Dudley railway station located in the town centre was closed under the Beeching Axe in 1964. It opened in 1860 on the junction between the South Staffordshire and the Oxford, Worcester and Wolverhampton lines, and in its heyday was a hub of services east to Birmingham (via a junction at Great Bridge), Walsall and Lichfield; north to Wolverhampton, Tipton and Coseley; and south-west to Stourbridge, as well as a line that served the small communities on the way to Old Hill and Halesowen. The site was later used as a Freightliner terminal by Freightliner UK, until an unpopular closure on 26 September 1989. A proposal to re-open the segment of line between Dudley and Dudley Port was unveiled in December 2014, to allow for a light rail link from the town centre to the main line, but this plan was scrapped in May 2016 as Dudley Council favoured keeping the line available for the proposed Midland Metro extension to Brierley Hill instead and shared heavy rail freight traffic to Walsall and Stourbridge. Dudley bus station is in the town centre and has many connections to surrounding towns, cities, and communities, including Birmingham, Halesowen, Smethwick, Stourbridge, Walsall, West Bromwich, and Wolverhampton, amongst others. The bus station also has coach services run by National Express, mostly to and from London or Wolverhampton. Other places served include holiday destination Blackpool, and London Heathrow and London Gatwick Airports. There are also small bus stations located at Russells Hall Hospital and the Merry Hill Shopping Centre. Dudley town centre has been served by a bus station at the junction of Birmingham Street and Fisher Street since 1952. The original bus station was cleared in 1984 and replaced by the current bus station, which became fully operational in 1987. Midland Red used to operate bus services in the town, mostly from its own bus depot, which opened in 1929. This depot was located on Birmingham Road and passed to West Midlands Passenger Transport Executive in 1973, along with operation of all bus services in Dudley. The depot was closed in 1993 and demolished a year later to make way for the Castle Gate roundabout, at the eastern end of the town's new southern by-pass. The island was built in 1997 and the bypass opened on 15 October 1999. Dudley is served by main roads which give a direct route to neighbouring towns. The longest of these roads are the B4176 (which runs to Wombourne, Bridgnorth and Telford) and the A461 (which passes through Wednesbury and Walsall, finally reaching Lichfield). The nearest international airport is Birmingham Airport, around 19 miles to the east. The nearest local airport is Wolverhampton Airport, which is about 10 miles to the west of the town. Dudley was the terminus point of two tram routes which opened in the later part of the 19th century. The first route, linking the town with Tipton and Wednesbury, opened on 21 January 1884 operating steam trams, the route being electrified in 1907 before being closed in March 1930 and replaced by Midland Red buses along the route. The second route opened a year later, linking the town with Birmingham and heading through the centre of nearby Tividale village on the Dudley-Tipton border. This line was electrified in 1904 and remained open until 30 September 1939, when it too was replaced by Midland Red buses. A proposed extension of the Midland Metro line, which would run from Wednesbury to Brierley Hill via Dudley, would re-instate a tram service through the town centre, and is awaiting approval. North-west of the town centre lies the Wren's Nest Nature Reserve, the first British nature reserve in an urban area and a site of special scientific interest (SSSI), considered to be one of the most notable geological locations in the British Isles. A part of the Much Wenlock Limestone Formation, it was heavily mined for centuries because of its large limestone deposits, and is also the location of one of the largest fossil sites in England. The town lends its name to the "Dudley locust", (also 'Dudley Bug'), a trilobite with the scientific name Calymene blumenbachii that was found in these limestone pits in 1749 by Charles Lyttleton. In the 1830s, Scottish geologist Sir Roderick Murchison visited the Wren's Nest to collect fossils as part of his research. 65% of his palaeontological evidence featured in the 1839 publication "The Silurian System" was from Dudley. Some of these fossils are still on display in the local Dudley Museum and Art Gallery. The current figure for the population of Dudley is 79,379. This figure differs considerably from that given at the 2001 census (194,919), which led to it being considered one of the largest towns in Britain without city status. However, this change is not due to large population movements but to a redefinition of the town's boundaries (for example, Kingswinford with a population of over 50,000, included as Dudley in the 2001 census, is now considered a separate town). In addition, the 2001 Urban Subdivision included Brierley Hill, which the local authority considers a separate town. It also included other local centres such as Sedgley and Gornal. The English Defence League demonstrated in the town centre on 3 April 2010, to protest against a planning application put forward by local Muslims to build a mosque just outside the town centre. Although there were no injuries at the event, eight people were arrested and there were several instances of criminal damage. On 17 July 2010, members of the English Defence League again gathered in Dudley. This time there were several confrontations between the demonstrators and the police, and also at a counter-demonstration attended mainly by local anti-racists. English Defence League members threw bottles, cans, coins and pieces of wood as they pulled down metal railings placed there to contain the demonstration. Some supporters were treated at the scene for injuries, including one of the EDL leaders that day who suffered a head wound in an incident. In the days after the event, twenty offences were pursued by police, including those of acts vandalism on cars, local homes, restaurants, and a Hindu temple. Dudley is served by a range of primary schools. Several of these are church schools. For example, Jesson's Church of England Primary School, St Chads Roman Catholic School, St Edmund's and St John's Church of England Primary School and Netherton Church of England Primary School are all Church of England primary schools. Other primary schools in the town include Dudley Wood Primary School, Priory Primary School, Kates Hill Primary School, Sledmere Primary School, Russells Hall Primary School, Milking Bank Primary School, Highgate Primary School, Northfield Road Primary School, Dudley Wood Primary School, Foxyards Primary School, Netherbrook Primary School (in Netherton), Blowers Green Primary School and Wrens Nest Primary School. Many of these schools are named after the housing estates they are located within. Primary schools throughout the Dudley borough all provide education for pupils aged 5 to 11 years. Some schools also have nursery units for pupils aged 3 and 4 years. From 1972 to 1990, schoolchildren in Dudley, Sedgley, Coseley and Brierley Hill stayed at primary school until the age of 12. Halesowen ran a 5–13 first and middle school system from 1972 to 1982, while Stourbridge and Kingswinford have always had a traditional 5–11 infant and junior system. There are several secondary schools in and around Dudley. The Dudley Academies Trust, created in association with Dudley College, runs four of these: Beacon Hill Academy in Sedgley, The Link Academy in Netherton, Pegasus Academy in Holly Hall, and St James Academy near the town centre. Bishop Milner Catholic College is a Roman Catholic secondary school in the town. Opened in 1960, it became one of the first Roman Catholic secondary schools in the region and is the oldest existing secondary school – by name – in Dudley. All of the town's grammar schools were changed to comprehensives in 1975. Casualties of this change included Dudley's girls and boys grammar schools, which merged with the nearby Park Secondary School to form The Dudley School (which in turn became Castle High upon a merger with The Blue Coat School in 1989, and now comprises the St James Academy). Several other grammar schools, such as the High Arcal School (now Beacon Hill Academy), survived merely with a change in status. Dudley traditionally ran a system of 5–7 infant, 7–11 junior and 11+ secondary schools, but in September 1972 the system was altered to create 5–8 first, 8–12 middle and 12+ secondary schools; though this system was not introduced in the Kingswinford area. The traditional school system was restored in September 1990, since Stourbridge (which had become part of the borough in 1974) had retained the traditional system, and Halesowen (also part of the borough since 1974) had reverted in 1982. At this time all of the town's remaining sixth forms were closed in favour of concentrating post-16 education in the borough's further education colleges. There are several special schools within Dudley, to cater for students with special educational needs. The Old Park School serves pupils from the age of 3 to 19, and was originally located in the Russells Hall Estate, but relocated to new premises in Quarry Bank in 2011. The Rosewood School also caters for children within the age range. It was built on the Russells Hall Estate during the 1960s, but relocated to the former Highfields Primary School site in Coseley in March 2008. The Woodsetton School near Sedgley caters to pupils from ages 4–11. Sutton School, built in 1962 in Russells Hall, caters only for pupils from 11–16. As well as The Dudley School, Sir Gilbert Claughton School and The Blue Coat School, which merged to form Castle High School, other defunct schools in the town include Rosland Secondary School, which became part of The Blue Coat School in 1970, and Park Secondary School. The Mons Hill School also shut down as a result of falling pupil numbers; it had originally opened in 1965 to replace the Wolverhampton Street School. Primary schools that no longer exist include St James' School (erected in 1842), St John's Primary School and St Edmund's Primary School, which merged to form St Edmund's and St John's Church of England Primary School in the 1970s. The St Edmund's building still exists on the corner of Castle Hill and Birmingham Street, and is now used as a mosque. Sycamore Green Primary School shut down in July 2006 as a result of falling pupil numbers. Staff and pupils were transferred to the nearby Wrens Nest Primary School, and the school buildings are now used as a Pupil Referral Unit for students studying at Key Stage 3. Dudley College is a college of further education situated mainly in the north of the town centre. Two new campuses were opened in 2012 as part of on-going plans to establish a 'learning quarter' in the town centre, relocating facilities from the other sites at Castle View and Wren's Nest. Originally established as a Mechanics' Institute in 1862, it is the only college of further education in the town, and along with Halesowen College and several campuses of the Birmingham Metropolitan College (formerly part of the now-defunct Stourbridge College), it is one of three further education colleges in the wider borough. Until the summer of 2002, there was a campus of the University of Wolverhampton within the town. The newer part of the campus, built during the 1960s, was retained as part of Dudley College until 2012. The older buildings, which were originally a teacher training college built in 1905, were demolished soon afterwards with the site redeveloped for private housing. Dudley Library is situated on St. James's Road, in the town centre. The present building, a Grade II listed Edwardian baroque, was designed by George H. Wenyon, and opened in 1909 to replace the older site in Priory Street. The town has had a public library since 1878. The library underwent a major expansion in 1966, and significant refurbishment in 2002 and 2012. The library service also operates eight branch libraries and four self-service 'Library Links', along with four other main libraries situated throughout Dudley Borough, including Netherton Library, which moved buildings to the Savoy centre in 2012. A controversial re-structuring and modernisation of the service between 2006 and 2009 lead to the closure of several smaller borough libraries in favour of the 'Library Links'. The Joseph Guest Hospital's Victorian wing, pictured in 2011. Dudley is currently served by several major National Health Service facilities. The oldest, the Guest Hospital, was initially created as a charity hospital by the Earl of Dudley in 1849 to accommodate blinded miners. It was taken over by local chainmaker Joseph Guest in 1871, and converted for general hospital use. It remained in use throughout the twentieth century, but was downgraded to an outpatient-only centre in the 2000s following the construction of a new block; the original hospital site has since been redeveloped for private housing in 2018. The town's other general hospital, Russells Hall, was constructed in 1976, but financial difficulties prevented it from opening until 1983. A major expansion of the hospital was completed in 2005 when it incorporated all inpatient services from the other hospitals in the borough. It now serves as the main hospital for the Dudley area. Bushey Fields Hospital provides psychiatric care for the borough. It was developed adjacent to Russells Hall in the 1980s and early 1990s to replace facilities at Burton Road Hospital. Approximately one mile west of the town centre, Burton Road Hospital was built in the mid-19th century as a workhouse, before becoming a hospital in 1859. It closed in December 1993, and was demolished the following year. The town's ambulance station was opened on land adjacent to Burton Road Hospital in 1986. In October 2006, Dudley Beacon and Castle Primary Care Trust and Dudley South Primary Care Trust merged to become Dudley Primary Care Trust. As of January 2012, it is chaired by Gill Cooper. Law enforcement in Dudley is carried out by the West Midlands Police, with the borough's sole police station located in Brierley Hill. Closure of Dudley police station was announced in 2017 as part of cost-cutting measures, though a small number of officers are set to remain in the town centre from a shared base with the local council. The police station had originally opened in 1939 to replace a 19th-century structure on Priory Street, which now forms part of the civic centre. Fire and rescue services are provided by the West Midlands Fire Service, with the fire station situated on Burton Road on land previously occupied by Burton Road Hospital. The former fire station site on Tower Street now forms part of a campus of Dudley College. West Midlands Ambulance Service provides emergency medical care, with the ambulance station also on Burton Road, near to the fire station. There is also a Dudley Detachment of the Army Cadet Force, Air Cadet Squadron, and Sea Cadet unit based in Dudley. The Army Reserve Centre on Vicar Street houses both Army Cadets and Air Cadets. Part of the Anglican Diocese of Worcester, Dudley has its own Archdeaconry and suffragan bishop. The town is served by numerous parish churches, including the Church of St. Edmund, Church of St. James, and Church of St. Thomas within the town centre. In the Kate's Hill area of Dudley, one can find St John's church, whose graveyard contains the burial place of William Perry a 19th-century Prizefighter, known as the Tipton Slasher. The oldest church in the town is St. Edmund's, dating back to Anglo-Saxon times, although the present building was not constructed until 1724, following its demolition during the English Civil War. St. Thomas' church dates from the 12th century, and was rebuilt in the 1815 after the original building was declared 'unsafe'. Both sites are now Grade II* listed. Dudley Priory was a Cluniac priory founded circa 1160 by the Lord of Dudley, Gervase de Paganel, and controlled several churches in the surrounding area. After its initial dissolution in 1395, it reopened as a denizen priory, and remained in use until the Dissolution of the Monasteries. Today the ruins form part of the surrounding Priory Park. The Archdeacon of Worcester, inducted in November 2014, was Vicar of St. Francis Church in Dudley for eight years. Catholics in the town are served by a church dedicated to Our Blessed Lady and St Thomas of Canterbury situated in St Joseph Street near the bus station. The church, designed by architect Augustus Pugin, dates from 1842 and has been Grade II listed since 1949. There are two Methodist Churches in Dudley: Central Church is at Cross Street near the town centre and there is another church at Dixon's Green. Dudley Baptist Church is on Priory Road in the centre of town. There is also a thriving Salvation Army Church in Dudley on North Street. Dudley also has places of worship for other religious groups and Christian denominations, including a Jehovah's Witness Kingdom Hall, two Sikh gurdwaras, and a Hindu temple. The old St Edmund's Church School, which closed in 1970 on a merger with St John's Church School, was converted into a mosque for the town's growing Islamic community, with an additional mosque also opening in the Queen's Cross area of the town. In 2003, plans were unveiled for the construction of a new mosque (which become known as the "Super Mosque" locally) in Hall Street, as site that had been leased by Dudley Council to the Dudley Muslim Association, in exchange for a site impacted by a proposed bypass. The mosque proposals were scrapped in May 2010, after a long dispute, in favour of an expansion to the existing Dudley Central Mosque in Castle Hill, an appeal was made by the Dudley Muslim Association against the High Court ruling, and failed in February 2014. Dudley is served by a number of local newspapers. The town has its own version of the Express & Star, published daily Monday to Saturday. There are also Dudley News, which is published weekly, and (based at Dudley Archives and Local History Centre on Tipton Road in Dudley) the Black Country Bugle, which looks at the history of Dudley and the rest of the Black Country. Dudley was also served by the Dudley Evening Mail until its absorption into the Birmingham Evening Mail in late 1986. Televised local news is provided through Midlands Today and Central Tonight, which also serve the wider area of the West Midlands. BBC Radio WM, Free Radio (formerly Beacon Radio), Heart West Midlands, Kerrang! Radio, and Smooth Radio 105.7 are some of the local radio stations that can be received in Dudley, also serving the wider West Midlands. Black Country Community Radio[permanent dead link] broadcasts online from its Dudley Studios serving The Central and Northern Black Country. The Kates Hill Press, founded in 1992 and named after a famous Dudley landmark, is a small press concentrating on the publishing of fiction and non-fiction of mainly local and regional interest. The town centre is home to several high street retailers, including River Island, Wilko, Argos, Peacocks, and New Look. There are also branches Subway and Costa Coffee. McDonald's, British Home Stores, Marks & Spencer, and Debenhams have all had branches in Dudley Town Centre in the past. Most of Dudley's shops are concentrated along the Market Place and adjacent side streets. Established in the 12th century, Dudley Market is situated on a wide part of the High Street, and is a major shopping area for the town. It has undergone numerous developments in its history, including pedestrianisation in 1982, and the removal of 12th-century cobblestone paving. Other developments have included the addition of a new roof and toilet facilities, with the new ground level block having replaced underground toilets in the early 1990s. There are also three small shopping centres situated off the High Street: the Churchill Shopping Centre, the Trident Shopping Centre, and the Fountain Arcade. By 2014, Dudley Town Centre had become increasingly rundown, with nearly a third of its shop units vacant, the highest figure for a medium-sized town centre in Britain. Retailing was particularly hard hit by the opening of the Merry Hill Shopping Centre three miles away, between 1985 and 1990. This led to the exit of the majority of major retailers, including British Home Stores (June 1990), Marks & Spencer (August 1990), Sainsbury's (August 1989), C&A (January 1992), and Littlewoods (January 1990), all of which closed before or soon after new stores opened at Merry Hill. Although the town was already in slight decline at the time following the recession of the early 1980s, the opening of the Merry Hill Centre resulted in a 70% decline of the town's market share in retail between 1985 and 1990. Dudley residents and traders have asked for the removal of the parking charges in Dudley, which they see as a barrier to people coming into the town, whereas Merry Hill Centre has always had free parking). Dudley Council has refused to reduce or remove parking charges citing "loss of revenue". Critics of the council point out that more revenue is lost through shoppers going elsewhere. Since 2008, another economic downturn has led to retailers including Beattie's, H. Samuel, Dorothy Perkins, Thornton's and Millet's and WH Smith also planning to close later in 2013. The town also lost its Woolworths store after nearly 100 years just after Christmas 2008 when the retailer went into liquidation. The Bean Cars factory was opened in the first years of the twentieth century and remained in use until the 1930s, but survives to this day for other industrial use. Sculpture for James Whale, outside Dudley Showcase Cinema. Sir Henry Dudley (1517 in Dudley Castle – 1568) English soldier, sailor, diplomat, and conspirator of the Tudor period. John Badley (1783 in Dudley – 1870) FRCS, surgeon of Dudley and medical pioneer. Theophillus Dunn (c. 1790 - 1851) Fortune teller and magical healer from Netherton, known as the "Dudley Devil". Frank Evers Beddard FRS FRSE (1858 in Dudley – 1925) English zoologist, he became a leading authority on annelids, including earthworms and oligochaetes. Bert Bissell (1902 in Dudley – 1998), mountain climber, peace campaigner. Dudley was twinned with Fort William in his honour. Sue Lawley OBE (born 1946 in Sedgley) is an English TV  and radio broadcaster. John Barnes (born 1961 in Dudley) radio broadcaster and journalist for the BBC. Joe Smith (1889 in Dudley – 1971), footballer and football manager of Blackpool for the 1953 FA Cup final victory over Bolton, dubbed the "Matthews Final"
Dennis Stevens (1933 in Dudley – 2012) English footballer, played mainly for Bolton Wanderers F.C. and Everton F.C. George Andrews (born 23 April 1942) English former professional footballer, making over 400 appearances, scoring 149 goals mainly at Southport F.C., Shrewsbury Town F.C. and Walsall F.C. Richard Forsyth (born 1970 in Dudley) English footballer, made nearly 250 appearances for Stoke City F.C. Peterborough United F.C. and Cheltenham Town F.C. Chris Westwood (born 1977 in Dudley) footballer, made over 500 appearances, most for Hartlepool United F.C. Matthew Barnes-Homer (born 1986 in Dudley) English professional footballer  who mainly played for Kidderminster Harriers F.C., Luton Town F.C. and Macclesfield Town F.C. Reece Brown (born 1996 in Dudley) English footballer  who plays for Chesterfield F.C., on loan from Birmingham City F.C. The borehole in local author Hugh Walters' juvenile science fiction story The Mohole Mystery was sited in Dudley. Footballer Duncan Edwards (1936–1958), was born in Woodside, Dudley, and is commemorated by a statue in the town centre. Dudley is the largest town in England never to have had a league football club. The town's key football teams, Dudley Town F.C. and Dudley Sports F.C. have never progressed beyond the Southern League. Dudley Town is the older of the town's two clubs, and have enjoyed the most success. Their most notable success came in 1985 when they won promotion to the Southern Premier League, but in the same year they were forced to quit Dudley Sports Centre (at the junction of Tipton Road and Birmingham Road) due to mining subsidence. They played at Round Oak Sports Ground in Brierley Hill for the next 11 years, and then spent a season ground-sharing at Halesowen Town, before resigning from the Southern League due to financial difficulties. The club was reformed in 1999 to compete in the West Midlands Regional League, and ground-share with Stourbridge at the War Memorial Athletic Ground. In 1981, when still playing at Dudley Sports Centre, Dudley Town played a prestigious game against Wolverhampton Wanderers to commemorate a refurbishment of the stadium, with the new floodlights being switched on by legendary former Wolves player Billy Wright. For some time after leaving Dudley Sports Centre, there were hopes that it could be made safe for Dudley Town to return, but these plans never materialised and the site was instead redeveloped as a business and leisure complex which has been developing since 2000. The club play at the Dell Stadium in Pensnett. The Dudley Kingswinford Rugby Club is the local rugby team, which play at their grounds in Wall Heath. For a short period, a speedway team called Dudley Heathens attempted to find a site to race in Dudley. The team plays in Wolverhampton and Birmingham due to the lack of a speedway track within the Dudley borough. The team were originally called the Cradley Heath Heathens, due to the proximity of their home track at Dudley Wood Stadium to the Cradley Heath/Dudley boundary. The stadium was demolished in the mid-1990s to make way for housing development, with the club disbanding shortly afterwards, before it re-formed with the name Dudley Heathens in 2010. Though there have been attempts by the club to move back into the town, they have so far been rejected by the local authority. The team re-adopted the name Cradley Heathens in 2013. Former World Champion riders from the team include Erik Gundersen and Bruce Penhall. Following a merger with the Coseley Volleyball Club, Wombourne V.C. play at the Evolve campus of Dudley College, in the town centre. They compete in the West Midlands Volleyball Association. ^ "Usual resident population by five-year age group, local authorities in England and Wales". 2011 Census. Office for National Statistics. Retrieved 16 July 2012. ^ "Dudley leaders fly the flag for the borough after announcing it is the capital of the Black Country". Halesowen News. 22 January 2014. Retrieved 4 February 2014. ^ "Black Country Day 2014: There's so much for us to be proud about". Express & Star. 21 January 2014. Retrieved 4 February 2014. ^ "Dudley flies flag as capital of the Black Country". Dudley Metropolitan Borough Council. Archived from the original on 22 February 2014. Retrieved 4 February 2014. Chisholm, Hugh, ed. (1911). "Dudley" . Encyclopædia Britannica. 8 (11th ed.). Cambridge University Press. pp. 637–638. ^ "Dudley — Domesday Book". Open Domesday. Retrieved 22 September 2013. ^ "Dudley Castle". Dudley and West Midlands Zoological Society. Retrieved 22 September 2013. ^ a b c d e f "Parishes - Dudley". A History of the County of Worcester. 3: 90–105. 1913. Retrieved 22 September 2013. ^ a b c "The history of Dudley Castle". The Friends of Dudley Castle. Retrieved 22 September 2013. ^ "Holbeache House". English Heritage. Retrieved 22 September 2013. ^ "Antique condoms' Dutch Journey". BBC News. 30 October 2003. Retrieved 22 September 2013. ^ Martin, James. "Condoms, Cathedrals, Castles and Caves". about.com. Archived from the original on 5 February 2013. Retrieved 22 September 2013. ^ a b "Dud Dudley and Abraham Darby; Forging New Links". Black Country Society. Archived from the original on 19 February 2009. Retrieved 28 May 2015. ^ "Dud Dudley's Metallum Martis". lostlabours.co.uk. Retrieved 22 September 2013. ^ "Newcomen Engine". Black Country Living Museum. Retrieved 22 September 2013. ^ "Edward Short's Newcomen Engine account book". The National Archives. Retrieved 22 September 2013. ^ Lee, William, Report to the General Board of Health on a preliminary inquiry into the sewerage, drainage and supply of water, and the sanitary condition of the inhabitants of the Parish of Dudley in the county of Worcester, London, 1852. ^ a b "Dudley CB Boundary Changes". Vision of Britain. Archived from the original on 3 November 2007. Retrieved 18 August 2011. ^ "Worldwide plea over Dudley Zoo buildings". BBC News. 8 October 2009. Retrieved 22 September 2013. ^ "A Brief History of Kingswinford". Kingswinford and District Historical Society. Archived from the original on 22 September 2013. Retrieved 22 September 2013. ^ "Sedgley". Open Domesday. domesdaymap.co.uk. Retrieved 22 September 2013. ^ "Dudley Registration District". GENUKI. Retrieved 22 September 2013. ^ "Birmingham UK Com". Birminghamuk.com. Archived from the original on 1 June 2002. Retrieved 30 September 2013. ^ Chandler, G.; Hannah, I.C. (1949). Dudley as it was and as it is today. London: B.T. Batsford Ltd. pp. 148–162. ^ Higginbotham, Peter. "The Workhouse in Dudley, Worcestershire". The history of the workhouse. www.workhouses.org. Retrieved 9 December 2013. ^ Dudley's Little Book of Big History. Dudley MBC. 2008. ^ Clare, David (2009). Images of England – Dudley. The History Press. p. 75. ISBN 978-0-7524-3534-3. ^ "Dudley fails to get Queen's Diamond Jubilee city status". Birmingham & Black Country. BBC News. 14 March 2012. Retrieved 14 March 2012. ^ "UK Polling". Retrieved 7 February 2012. ^ Holder, Bev (17 October 2017). "Dudley North MP Ian Austin brands latest Boundary Commission proposals a "complete dog's breakfast"". Dudley News. Newsquest. Retrieved 18 November 2017. ^ "Our Mission". About Us. Dudley Zoological Gardens. Retrieved 17 August 2012. ^ "Dudley Zoological Gardens". Discover Dudley. Archived from the original on 29 October 2011. Retrieved 17 August 2012. ^ "Scheduled Ancient Monuments". Historic Environment. Dudley Metropolitan Borough Council. Archived from the original on 2 July 2012. Retrieved 17 August 2012. ^ "A to Z of Listed Buildings in Dudley". Historic Environment. Dudley Metropolitan Borough Council. Archived from the original on 23 December 2012. Retrieved 4 November 2012. ^ "Grade I Listed Buildings in Dudley, England". British Listed Buildings Online. Retrieved 4 November 2012. ^ "Grade II* Listed Buildings in Dudley". British Listed Buildings Online. Retrieved 4 November 2012. ^ Roe, Ken. "Dudley Hippodrome Theatre". Cinema Treasures. Retrieved 15 May 2018. ^ "Keys handed over as Dudley Hippodrome deal is sealed at last". Express & Star. 5 December 2016. Retrieved 12 January 2017. ^ "Dudley Hippodrome campaign group's lease terminated". BBC. 9 February 2018. Retrieved 15 May 2018. ^ "Dudley Museum shuts as Council cuts bite". Express & Star. 23 December 2016. Retrieved 12 January 2017. ^ "Sandwell & Dudley Station". Domesday Reloaded. BBC.co.uk. Retrieved 18 June 2012. ^ "Dudley Railway Station, Dudley". Black Country History. Retrieved 4 November 2012. ^ "Dudley Station". Rail Around Birmingham. Retrieved 18 August 2011. ^ "Light rail link hopes linking Sandwell and Dudley are dashed". Express & Star. 16 May 2016. Retrieved 12 January 2017. ^ "tiptoncivicsociety.co.uk". tiptoncivicsociety.co.uk. Archived from the original on 15 September 2012. Retrieved 30 September 2013. ^ "Wednesbury to Brierley Hill Extension information". Centro. Archived from the original on 9 April 2012. Retrieved 18 June 2012. ^ "West Midlands (City of Wolverhampton, Walsall, Dudley, Sandwell, Birmingham, Solihull and Coventry Districts)". Natural England. Archived from the original on 19 January 2012. Retrieved 10 October 2011. ^ "West Midlands (City of Wolverhampton, Walsall, Dudley, Sandwell, Birmingham, Solihull and Coventry Districts)". Discover Dudley. Archived from the original on 25 April 2012. Retrieved 10 October 2011. ^ "Wren's Nest National Nature Reserve". Dudley Metropolitan Borough Council. Archived from the original on 3 September 2011. Retrieved 10 October 2011. ^ Alex J. Chestnut. "Using morphometrics, phylogenetic systematics and parsimony analysis to gain insight into the evolutionary affinities of the Calymenidae Trilobita". OhioLINK ETD Center. Retrieved 21 August 2011. ^ "Geology of Wren's Nest Nature Reserve". Dudley MBC. Archived from the original on 27 November 2011. Retrieved 6 December 2011. ^ Broughton; Roberts (2011). "The Silurian System". ^ UK Census (2011). "Local Area Report – Dudley (Dudley) Built-up area (1119883998)". Nomis. Office for National Statistics. Retrieved 14 March 2018. ^ UK Census (2011). "Local Area Report – Dudley Local Authority (1946157188)". Nomis. Office for National Statistics. Retrieved 14 March 2018. ^ UK Census (2011). "Local Area Report – West Midlands Region (2013265925)". Nomis. Office for National Statistics. Retrieved 14 March 2018. ^ UK Census (2011). "Local Area Report – England Country (2092957699)". Nomis. Office for National Statistics. Retrieved 14 March 2018. ^ a b "Built-Up Area Populations of UK Towns and Cities - 2011 Census". ^ "Brierley Hill Town Centre". Dudley MBC. Retrieved 4 June 2013. ^ a b "Violence Erupts at EDL Protest". Stourbridgenews.co.uk. 3 April 2010. Retrieved 18 August 2011. ^ "Police continue to investigate criminal damage offences". Dudleynews.co.uk. 21 July 2010. Retrieved 18 August 2011. ^ "Welcome to Dudley Academies Trust". Dudley Academies Trust. Retrieved 6 November 2018. ^ "Welcome". Old Park School. Archived from the original on 26 November 2013. Retrieved 21 August 2013. ^ "Special school in move to new home". Dudleynews.co.uk. 7 May 2008. Retrieved 18 August 2011. ^ "About Us". Woodsetton School. Retrieved 21 August 2013. ^ Alex Ross (27 September 2012). "New sixth form opens at Dudley College". Express & Star. Retrieved 9 October 2012. ^ "Universities and Colleges guides: Dudley College guide". The Daily Telegraph. London. Retrieved 9 December 2013. ^ "Stourbridge College's vision for the future shown in image". Express & Star. 14 August 2013. Retrieved 21 August 2013. ^ "Public Library – Dudley". British Listed Building. Retrieved 10 January 2012. ^ Clare, David (2005). Images of England: Dudley. Tempus Publishing. p. 106. ISBN 0-7524-3534-5. ^ "A History of Dudley". Localhistories.org. Retrieved 18 August 2011. ^ "Dudley Library due for £200k revamp". Express & Star. 16 May 2012. Retrieved 27 December 2012. ^ "Libraries". Dudley MBC. Archived from the original on 4 December 2011. Retrieved 10 January 2012. ^ "Dudley libraries modernisation". Museums, Libraries & Archives. Archived from the original on 20 March 2011. Retrieved 10 January 2012. ^ Farrington, Dayna (19 December 2018). "Dudley Guest Hospital site transformed into homes as work complete". Express & Star. MNA. Retrieved 7 March 2019. ^ "Bushey Fields Hospital". Specialist Info. 1 April 1974. Archived from the original on 27 September 2007. Retrieved 18 August 2011. ^ "NHS in England: Dudley PCT Organisation Summary". Nhs.uk. Archived from the original on 19 April 2007. Retrieved 18 August 2011. ^ Ross, Alex (13 November 2017). "Dudley police station to relocate into council offices". Express & Star. MNA. Retrieved 7 March 2019. ^ "New Dudley College building hits the high point". Express & Star. 15 December 2011. Retrieved 17 August 2012. ^ "Dudley St Edmund". Parish Records. Worcester Branch of the Birmingham & Midland Society for Genealogy and Heraldry. Retrieved 8 November 2012. ^ "Saint Thomas's Church" (PDF). Dudley Metropolitan Borough Council. Retrieved 8 November 2012. ^ "Parishes – Dudley". A History of the County of Worcester. British History Online. Retrieved 8 November 2012. ^ "Church of St Edmund – Dudley". Grade II* Listed Buildings in Dudley. British Listed Buildings Online. Retrieved 8 November 2012. ^ "Parish Church of St Thomas – Dudley". Grade II* Listed Buildings in Dudley. British Listed Buildings Online. Retrieved 8 November 2012. ^ Historic England. "Dudley Priory (118937)". PastScape. Retrieved 8 November 2012. ^ "Parish Directory - Our Blessed Lady and St Thomas of Canterbury, Dudley". www.birminghamdiocese.org.uk/. The Archdiocese of Birmingham. Archived from the original on 22 December 2015. Retrieved 17 December 2015. ^ "Roman Catholic Church of Our Lady and St Thomas, Dudley". www.britishlistedbuildings.co.uk/. BritishListedBuildings.co.uk. Retrieved 17 December 2015. ^ "Dudley Mosque Plan is Scrapped". Express & Star. 3 May 2010. Retrieved 18 August 2011. ^ "Appeal granted over rejection of mosque". Express & Star. 27 July 2012. Retrieved 17 August 2012. ^ "Appeal fails on plan for Dudley mosque". Express & Star. ^ "Dudley News". Dudley News. Retrieved 18 August 2011. ^ "freeradio.co.uk". freeradio.co.uk. Retrieved 30 September 2013. ^ "Dudley Market – Our History & Future". Business. Dudley Metropolitan Borough Council. Archived from the original on 14 November 2011. Retrieved 8 November 2012. ^ "Dudley 'worst among medium centres' for empty shops". BBC News. 4 September 2012. Retrieved 8 November 2012. ^ Roger Tym and Partners (1993). Merry Hill Impact Study. HMSO. ISBN 0-11-752786-6. ^ "WH Smith store in Dudley is to shut". Express & Star. 29 June 2013. Retrieved 29 July 2013. Chisholm, Hugh, ed. (1911). "Phillips, Thomas" . Encyclopædia Britannica. 21 (11th ed.). Cambridge University Press. p. 407. ^ Raven, Jon (1986). Stories, Customs, Superstitions Tales, Legends & Folklore of the Black Country & Staffordshire. Broadside. ISBN 0-946757-03-8. ^ Tump, Aristotle (1986). A Memorable Medley of Great Black Country Characters. A Bugle Publication. ^ "A few of the athletic feats achieved by Joe Darby, Achilles of the Black Country". Black Country Bugle. 5 August 2004. Archived from the original on 12 January 2011. Retrieved 6 December 2012. ^ "Duncan Edwards (1936–1958) – Find A Grave Memorial". Findagrave.com. Retrieved 18 August 2011. ^ Emporis GmbH. "Butterfield Court entry". Emporis. Retrieved 18 August 2011. ^ Keith Slater. "Gallery four: Black Country". BBC Black Country Website – Photo Galleries. Retrieved 27 December 2006. ^ "The Grimleys (TV series)". Internet Movie Database. Retrieved 12 October 2011. ^ "Which is the smallest English town/city ever to have hosted a top-flight football team? And which is the largest never to have done so?". The Guardian. London. Retrieved 4 March 2007. ^ "Location". Dudley Kingswinford Rugby Club. Archived from the original on 20 January 2013. Retrieved 2 January 2013. ^ "Heathens come back at Cradley". Express and Star. Retrieved 17 March 2014. ^ "Cradley Heathens from a Stoke Potter's perspective". Black Country Bugle. 18 March 2010. Archived from the original on 15 March 2012. Retrieved 2 January 2013. ^ "Council leader: I'm not ignoring Heathens". Halesowen News. 15 March 2013. Retrieved 30 June 2013. ^ "Cradley Heathens". Cradley Heathens. Archived from the original on 30 October 2013. Retrieved 17 March 2014. ^ "Wombourne Volleyball Club". Wombourne Volleyball Club. Retrieved 14 November 2013. ^ "Our History". Gentlemen Songsters Male Voice Choir. Archived from the original on 5 October 2011. Retrieved 12 October 2011. 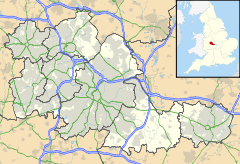 Wikimedia Commons has media related to Dudley, West Midlands.